I first met Kate Wilson from Hello Mums in June when we were both helping out at a local ballet show. Hello Mums was sponsoring the event. I could see the passion that Kate had and thought it would be lovely to feature Kate on pocketnannies. 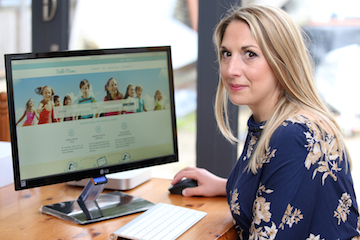 We conducted a little interview to help you grasp what Hello Mums is. Over to you Kate..
First of all please tell us what Hello Mums is? Hello Mums provides trusted local babysitters across London. Please tell us a little bit about yourself, (do you have a background in childcare)? Edina and I have been working with children for 17 years before setting up Hello Mums. I am a qualified teacher and a maternity nurse myself and we have done thousands of babysittings between the two of us. Jeremy makes sure our booking system and our iPhone app works smoothly. What made you set up Hello Mums? We wanted to raise the standard in private childcare to make sure every person working with children has an enhanced police check and paediatric first aid certificate rather than just experience in working with children. Having worked in this industry for many years we know that accidents can and do happen and we want to make sure we provide parents with reliable and trustworthy babysitters whom we know and trust. What sets Hello Mums apart from other babysitting agencies in London? We care about the personal experience – it is crucial to us that parents, children and babysitters alike are all very happy with us. We work very closely with all of our babysitters. Furthermore, we believe in helping the local community and we partake in many events to help other local businesses grow. We are also very proud to sponsor Ickle Pickles, a charity dedicated to helping premature babies and their families. How do you help new parents who are potentially nervous about leaving their child with a babysitter? Firstly, we have a long chat with them over the phone to find out what exactly they are looking for. We usually suggest one or two babysitters whom we would like to introduce to the new family. Secondly, we set an initial date where we make recommendations to the parents and we make an initial plan. After their first encounter we have another chat to see if all went well and on the basis of the parents’ needs we make a suggestion on further dates and times. As we work with babies as little as 9 days old it is crucial for us to make sure we help to make the mum’s life easier and we are here to help for as long and as often as they need an extra pair of hands. Many of our babysitters are maternity nurses and/or have a wealth of newborn experience, which helps put parents at ease. For those families where the child is older than 18 months old we usually suggest an initial hand over time where all parties can get to know each other a little, so that the parents feel confident about leaving their child with the babysitter. We heard Hello Mums is a relatively new site. Where do you hope to be in a year’s time? After every booking I personally get in touch with the parents to find out what they thought of their babysitters and to make sure they had the best experience possible. If you need a babysitter head to www.hellomums.co.uk or call Kate on 02038933336.